Are you looking for the ultimate bucket list activity during your New Zealand holiday? How about Skydiving? How about Skydiving from 20,000 ft above Franz Josef Glacier and the Westland National Park! The 20,000 ft Skydive replaces our 19,000 ft Skydive and you’ll get over 85 seconds of freefall once you’ve jumped (or been pushed) from our Pilatus Porter PC-6 Aircraft. We’ve even kept the price the same. You could say you’re paying for 19,000 ft and we’re giving you 1000 ft of freefall FREE! How’s that for a deal? We’ve been skydiving from high altitude since 2010 and in that time, we’ve completed thousands of jumps. We even pioneered the 20,000 ft skydive – we were the first company in New Zealand to jump from that high and we did it back in 2013 to set a new New Zealand Record. 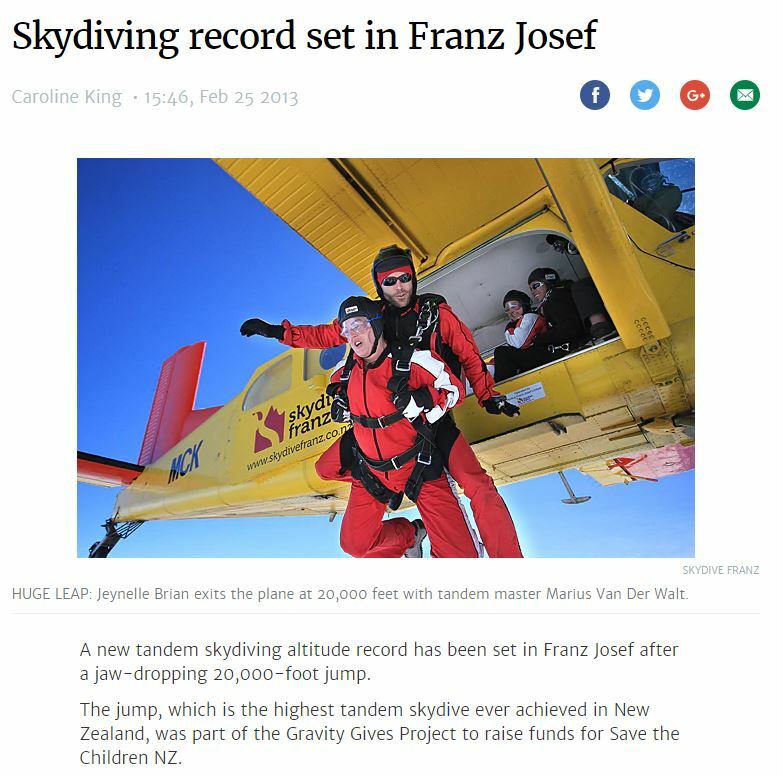 The jump originated from a collaboration with Gravity Gives Project to raise funds for Save the Children NZ, with the top fundraisers embarking on the 20,000ft feat. Fast forward to 2019 and we’ve got adrenaline junkies from all over the world completing the jump daily. We even made the newspaper. You can read all about it here! You’ll jump from flight level 20,000 ft, landing at our dropzone which is approximately 300ft above sea level. So what does jumping from 20,000 ft look like? Check out these photos our talented Camera Jumpers took! By jumping from 20,000 ft, you’ll be helping the Kea. Named by Māori for the sound of its call, the Kea is native to New Zealand and is the world’s only alpine parrot. With only a few thousand birds remaining, the Kea is a Nationally Endangered species. With the help of our donations, we can contribute to the restoration of the Kea’s habitat. Ready to book your skydive? We’ve got spaces, but they’re filling fast. Click Book Now to check availability.